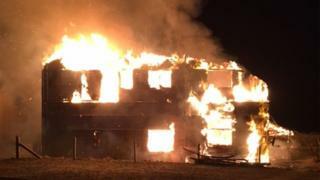 A fire has destroyed an internationally-renowned bird observatory on Fair Isle in Shetland. Extra fire crews were flown in from Sumburgh by helicopter with others arriving on the island by boat. Observatory president Roy Dennis said the building had been "lost to fire", adding it was "absolutely tragic news". Mr Dennis said: "Thank goodness no loss of life but heartfelt sympathy to David, Susannah and family and the islanders. We will rebuild. We have lost much and will lose a year. Close to my heart - very very sad." And Shetland MSP Tavish Scott described it as a "colossal blow to the isle". The fire is understood to have started in the roof. Photographer Rob Fray could see a plume of smoke from the blaze from the Sumburgh Hotel in Shetland - approximately 30 miles across the water. A statement on the Fair Isle Observatory & Guesthouse website said: "A major fire has tragically destroyed the Obs." A Scottish Fire and Rescue Service spokesman said: "Operations Control mobilised crews from Fair Isle and Shetland, with the crew from Lerwick transported via the Maritime Coastguard Agency's Search and Rescue helicopter. "Further resources were later mobilised to help tackle the fire, with two crews transported from Shetland to Fair Isle with the assistance of the RNLI." It is also important to the economy of Fair Isle, which is famous for its knitting and has a population of about 60.